"Only two of our sewage leaks were in ORs." Know your hospital's Safety Grade! 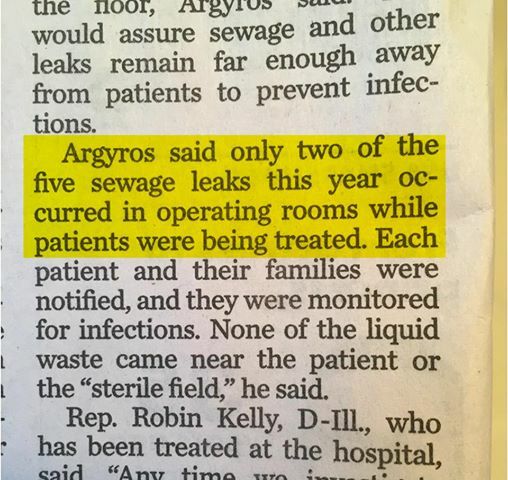 “Only two of our sewage leaks were in ORs.” KNOW YOUR HOSPITAL’S SAFETY GRADE. Snapshot of USA Today article, Sept. 17, 2017. I am way behind in things I want to blog about – I started this post eight weeks ago. It’s been a combination of crazy travel, lack of sleep, and a head-spinning disbelief about how messed up medicine is, on so many things, while in other cases it accomplishes stunning saves (like saving my life). Such wild swings in quality always mean a system is out of control, which means you better make a point of learning what you can about who manages things best. Here’s one of those topics. I hope to be able to dump out all these thoughts, good and bad, in the coming weeks. Do you know which hospital near you is safest? Do you know if any are dangerously unsafe, to be avoided? The newspaper clipping shown here is a true horror story that illustrates how important this can be. Regular readers know I’m an example of the best care, the top end of what healthcare can achieve. Ten years ago this Fall they told me I’d escaped stage IV cancer – we had beaten it, despite terrible odds. That’s the BEST of healthcare. But you need to be aware of the other end of the scale. The snapshot shown here is about a truly horrifying USA Today article in September about a Washington DC hospital. Is it a ghetto hospital, operating under Third World conditions? No; this is the preferred hospital for the White House and Congress. This is the hospital where Rep. Steve Scalise was taken this summer after being shot on the ballfield. And as you’ll remember, after he was out of the ICU, he developed new infections and had two more surgeries. How could anyone have known to avoid this place? Well, there are two separate data-driven safety rating systems, and they both give this hospital one of the lowest ratings. Hospital Safety Grade gives it a D.
The Hospital Compare site from CMS (the Medicare/Medicaid agency that pays for more US healthcare than anyone, and thus has tons of data) gives it two stars out of five. Remember, these aren’t some contest judge’s opinion, or some editor’s secret formula like the US News rankings. This is data. about problems that were reported at each hospital by the hospital. It may be that your local hospital is absolutely great, one of the best in the nation. I’m just saying you should know and you have a right to know. It’s no different from knowing which cars are safest & most reliable. And please give huge props to Hospital Safety Grades people for making a difference. Here’s their new press release noting how five states have made HUGE strides since this site got started. And if you (like me) always wonder what’s behind the ratings, check out my very first post about them, five years ago this month on the e-patient blog, in which I dug down into the numbers and created my own spreadsheet [right] to visualize what’s really there. You can learn what you need to know, before there’s a crisis. Be informed. This isn’t just about outing the baddies – it’s about rewarding the best! Find out which healthcare providers near you have been working hard to do a good job. Very timely post as the new Leapfrog Hospital Safety Grades were recently made public. Be sure to look at the hospitals grade history. This can tell a story of improvement or decline. Look at all the measures. Infection? Patient provider communication? Surgical outcomes?